Q. Are EBC parts the same size as original equipment? A. 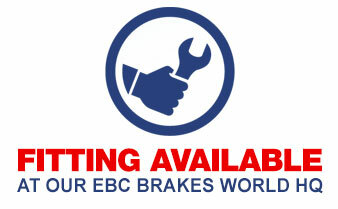 Yes, EBC Brakes produce parts that are the same technical dimensions as original equipment parts. Q. Are the product pictures of the actual part number? A. Some products feature a generic picture but brake pads show a line drawing of the pad. Motorcycle discs show an actual photographic image of the disc. Q. Can the courier call me before delivering the goods? A. No, couriers do not have company mobile phones. If possible use a work address to deliver to or a friends house. Q. Can you leave the delivery by the door, in the garage, under the car, in the shed etc? A. No, ALL deliveries must be signed for. Q. How much will it cost to send parts to this country? A. Simply finish adding the parts required to the cart. When viewing the cart contents page select your delivery country and enter your postcode. The web site will then display a cost and the delivery services available, based on your location and the total weight of your order. Depending on your location, there may be an extra shipping charge. You will be informed of this after you have placed your order and you may receive a request for further payment to cover the extra shipping cost. Q. When will my order be processed? A. Normally, orders placed on a business working day before 13:00 (UK time) will be processed on that day. Orders placed after 13:00 (UK time) may be processed the following business working day. Any orders processed outside of normal business opening hours will be processed on the next business working day. Q. I need to change my order that I have placed online, can you just charge my credit card the additional amount required? A. No. When an order is placed online, the payment is made via SagePay. They tell us if the payment is accepted or declined, but in either case we never see your full credit card details. Q. My credit card has been "Declined", can you tell me why? A. No, not exactly, as we are not specifically told why ourselves. All we can do is suggest some common reasons why a card has been declined. Click here for a list of those reasons. Q. I have received an email saying declined AND also received an email confirming the order details, do I have a valid order? A. Yes. This does occasionally happen. If you receive an email confirming your order details, parts and delivery address etc, please ignore the declined message. You will only be charged once. Q. I live outside of the UK but within the EU. Do I still pay UK VAT? Q. Will you declare my goods as a “gift” to avoid customs charges in my country? A. No. All international deliveries will have the correct paperwork according to customs rules. Q. Can you tell me how much import duty or VAT I will have to pay? A. You will need to contact your country’s customs office to find out what charges will be made when you receive your goods. Q. I live in Jersey or Guernsey. Why am I being charged UK VAT? A. Please select Jersey or Guernsey as the “Delivery Country” and UK VAT will be removed from your order. Q. How many sets of pads do I need? A. Most EBC automotive brake pad part numbers contain 4 pads, unless stated. The pads are sold to change a complete Axle set, so enough to change both sides. Q. Is the disc price for a pair or one disc? A. The price shown is for a pair discs, which will either be for the front or rear of the car. Q. I have received my Turbo Groove Discs / Ultimax USR Discs. The instructions on the box state I must remove the “protective layer”. How do I do this? A. These instructions are for the standard plain discs, which have a coat of oil on them. You need to remove this oil before using the discs. It is advisable to give ALL discs a clean with a suitable contact cleaner, meths or white spirit. Q. Multiple choices - I have viewed various selections for my vehicle and there is a choice of discs / pads to choose from. I don’t know which ones to select? A. You will need to view the technical diagrams for the brake pads (black and white images) or the technical dimensions listed for the brake discs. Then compare these to the parts fitted to your car. Unfortunately we cannot see your car to confirm which parts are required. Q. Do EBC sell car clutch kits? A. No, EBC do not make car clutch kits any more. Q. Do you sell shim kits? A. Yes, please email us if you wish to order shim kits. These are for cars only and you cut them to the size of your brake pads. Q. Do EBC Automotive discs come with ABS ring sensors? A. No. EBC’s technical department recommend removing the old ABS ring to fit to the new disc or purchasing new ABS rings from the car manufacturer. Q. Do EBC Automotive discs come with wheel bearings? A. Where the part number has a suffix of "B", yes these are already fitted. Q. I have received a set of four brake pads for my car. On my old set of four pads I had two metal wear sensors attached to two of the pads. The new set only has one metal wear sensor attached to one of the pads, is this correct? A. Yes, this is perfectly fine. As soon as this pad has worn down to the metal wear indicator level there will be a noise alerting you that the complete set of brake pads needs replacing. The wear sensor pad should always be fitted to the nearside inboard (piston side) position. Q. How do I know if I have SOLID or VENTED discs? A. Looking down on top of the disc currently fitted to the car, a solid disc looks like one piece of metal. Vented discs look like two pieces of metal, with vents in the middle. Q. Can you sell me a big brake conversion for my car? A. We sell replacement parts to the Original Manufacturers specifications. It may be possible to fit bigger discs to a specific car, but you would need to tell us the donor car details. Q. I have received an email / telephone call stating that I need to check the parts currently fitted to my vehicle and compare against the technical diagrams / dimensions provided. I thought you guys are the “Brake Experts”? A. We can only suggest what parts we think should be fitted to your vehicle. 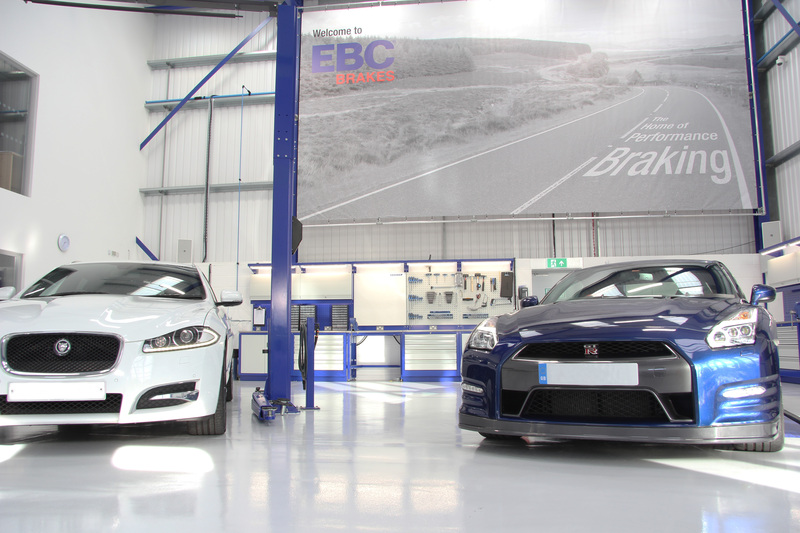 EBC did not make your vehicle and therefore cannot guarantee what parts the manufacturer may have fitted. We cannot see your vehicle to inspect the parts currently fitted, whereas you may be able to do this. Or a quick call to the manufacturer (main dealer) with the VIN / registration number asking for the parts department and they may be able to tell you solid or vented discs, overall diameter of discs, which brake caliper manufacturer you have fitted. Q. What does the (B) or (G) etc, mean after the standard pad part number? A. This suffix after the part number indicates which caliper manufacturer the pad is for. See the list further down the page to identify which one. Some manufacturers fitted two different makes of caliper to the same model / engine / year car. It will state somewhere on the caliper which make you have. Q. There is no selection for GT or 16v etc, which one is correct for my car? A. Models are listed by engine size and only listed by trim level where parts are unique to that level of trim. Q. Do you sell braided brake lines? A. Yes. All of our replacement stainless steel brake lines are braided. A. Most EBC brake pad part numbers contain 2 pads. Twin front discs will require two sets of pads to change both sides. Q. Do you sell disc bobbins? A. Yes, but only for the race discs. Road disc bobbins are machined on and cannot be replaced safely without the correct machinery. A. Yes. All of our stainless steel replacement brake lines are braided. Q. The oversize brake disc kit, do I need any further parts? A. The kits will fit most 6 bolt wheel hubs and the re-location bracket for your brake caliper fits most 50mm centre forks. If they do not fit, we will give you a full refund. Q. The pads I have ordered were the Green compound ones, why have I received Black ones? A. Some Green compound pads are not coloured Green, they just come as Black pads, but they are the Green compound material.